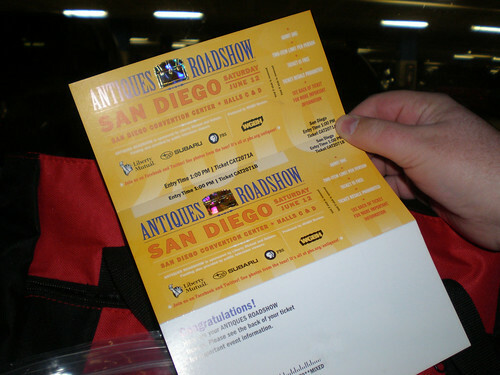 Back in June we journeyed to San Diego by way of Big Bear Lake and the Lawrence Welk Museum and the cradle of Euro-Californian civilization because we had tickets for... Antiques Roadshow! However, you are allowed to bring two items each, and I was determined to do so, even if we had to go out and buy something. (And so passed one fun afternoon slingshotting around the antique stores on Charleston.) One problem was that Mike, a purist, would get twitchy over any item made after 1940, and that was his generous boundary. 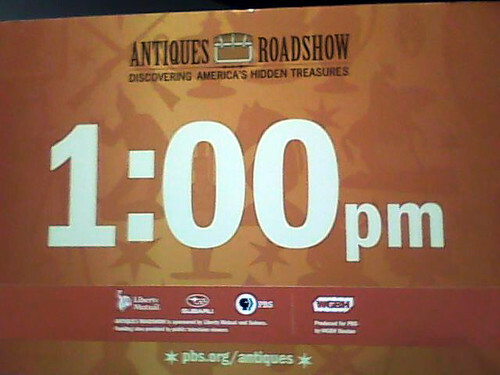 Antiques Roadshow often features stuff from the 1960s, though, so I was okay with vintage/retro goods. However, as much as I wanted to know more about (and know the value of) my Tarot de Acuario, its 1972 publication date even made me blush, so it stayed at home. The next most obvious candidate was the postcard typed on the Queen Mary and signed by Helena Rubinstein that I snagged when mindlessly checking eBay for QM postcards. Oh yes, definitely that. The third item would be a blue vase given to me by my (great) Aunt Mabel. She sent it to me out of nowhere, after we'd exchanged a couple of letters, saying that an old friend had given it to her long ago. Mike was a little mortified. The vase is chipped and is stamped as being made in Czechoslovakia, a country too young (while it lasted) to produce anything of "true" antique age. Plus it's dirty. No matter how often I gently work its floral nooks with a Q-tip, the grit of years remains. It's embarrassing. I can't even upload the image to Flickr. Here, show no one else! 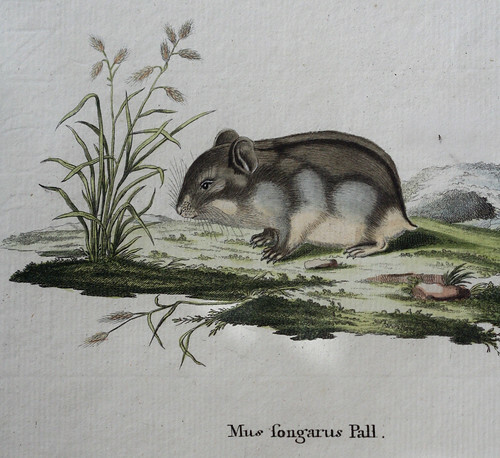 Finally, for our fourth item we decided to bring the dwarf hamster print allegedly from a 225-year-old book. To comfort Mike, I tried to convince him that our selections represented true funsies and no one would think we were just sad people who wouldn't know a hand-painted 19th-century Nippon chocolate set if it crunched to powder beneath our careless feet. However, what I just said isn't quite true. You can take all of the photos you want while waiting in line. Once you're on the set, though, no pics. So, all of my pics are sneak-shots from my old phone... from before I knew that pics were allowed. Our entire wait was around 90 minutes. 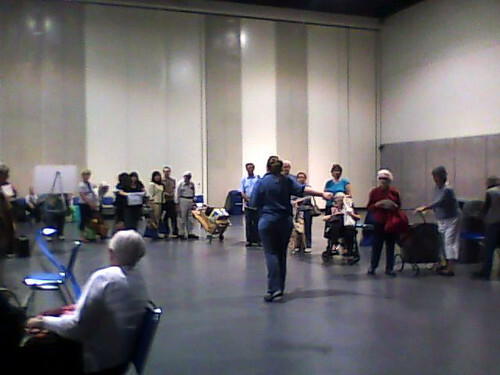 There were a few folding chairs set up to help with the demarcation of lines, but don't count on any being available. (You might get one for 20 seconds before the line moves or condenses.) We enjoyed looking at things other people brought, with our own shame left covered in a casino tote bag. Turn off all cell phones. Turn them off. Off-off-off. This is a TV soundstage you're about to walk into, people. 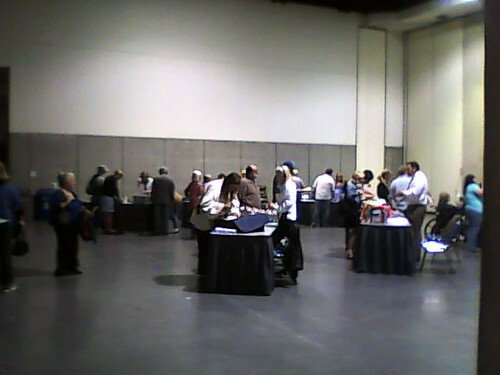 Before you enter the appraisal area (and soundstage), you must visit the tables at the end of the line and have the things you've brought categorized. You will be given one ticket per item. 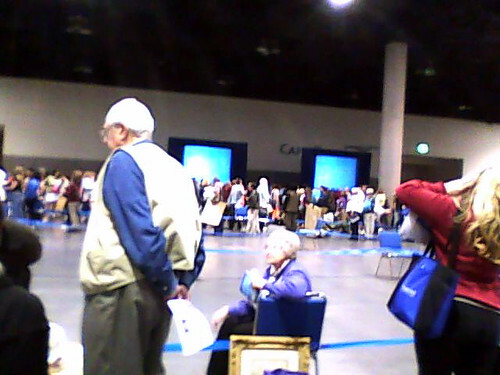 You will move past the open doors to the circular appraising area. There, you can decide which category to queue up for first. Mike of course apologized at length to the woman for what we brought, making sure she knew that his mother has a career in antiques and would die if she knew we were bringing broken pottery, old knives, and rodent art to an antiquing event. The woman was nice, sympathized with the shoemaker's children having no shoes, and gave us tickets for Pottery (the vase), Prints & Posters (the hamster page from Schreber), and Collectibles (the knife and the postcard). We decided to go with the Prints & Posters queue first. It was right there and didn't seem too long. I'm glad we started here; not only was it the most satisfying appraisal experience, but we got to stand next to Mark Walberg as he did his intros/outros/fun facts... and did them many, many times, with hilarious ad libs after the goofs that would probably make for a more fun show if they ever aired. Hot tip: Unless you're really curious about a painting you have, don't bring a painting. That was the longest queue of the bunch, and it stayed long the whole time. Like, so long that it stretched across the entire room - often ten times the length of other queues. Eventually we approached a pleasant-looking man whose friendly demeanor matched his open, agreeable face. 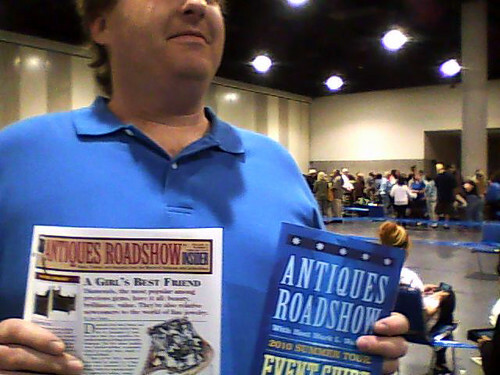 He seemed pleased with our print (how many hamsters does one see in the antique trade?) and, while he couldn't verify that it came from Schreber's book, he could verify it as being from the late 1700s. He asked us where we got it (eBay) and how much we paid (~$20), and I assured him that we got it because we like hamsters, not because we thought it had any value. "That's exactly what you should do," he said, nodding approvingly. After we left we were beaming - what a fun experience, what a neat guy! "You know," said Mike, "I think we've seen him on the show before." Mike and I aren't diehard fans - we know the furniture twins (and yes, we saw them - one walked right past us) and the rock-n-roll ponytail guy (more on him in a minute), but despite marathons of every episode our DVR could store, we're still pretty ignorant. Still, I agreed with Mike. The guy did seem familiar. Distinctive voice. Next we went to the short line for Pottery. Even I started to cringe as I looked at the delicate beauties people were gingerly handing to the appraisers. Loupes and lamps ornamented a row of high-brow scrutiny. Me, I stuck Aunt Mabel's vase out straight in front of me to the cool blonde who'd beckoned us over. "Hello!" I said. "I brought you a dirty, chipped vase!" "For me?" she breathed, with almost a smile. See, Mike? It's all about funsies. Obviously she spotted the Czech mark right away and, giving me a raised eyebrow, mentioned that it couldn't be older than 1918. I agreed and said it was my aunt's and I was just curious about it, and assured her that my expectations were low. She pointed out the (embarrassingly large - how did I miss that?) seam along the side, describing how that indicated hasty work, and she described a few other identifiers along those lines. I said we'd had a bet, with Mike saying it had no (retail) value, and me saying there had to be someone out there who would pay five bucks for it. "Mmmm," she continued in her quiet way. "I'll raise that a bit... call it twenty." After establishing the vase's age (from around 1950), we left to walk around to our final queue, Collectibles, very pleased with our experience so far. Oh sure, nothing could top the encounter over the hamster print (which I didn't describe very well because it's all just a blur of cheerful conversation), but the pottery woman was instructive. Since Aunt Mabel didn't care to elaborate on who the old friend was or why she received the vase, my imagination will just have to do the rest. The Collectibles queue may as well be called "Big Misc." It seems a little risky here, since you can't guarantee that your appraiser will know much about your particular item. Like, there may be a knife expert, but you may get stuck with the guy who knows all about troll dolls... or something like that. 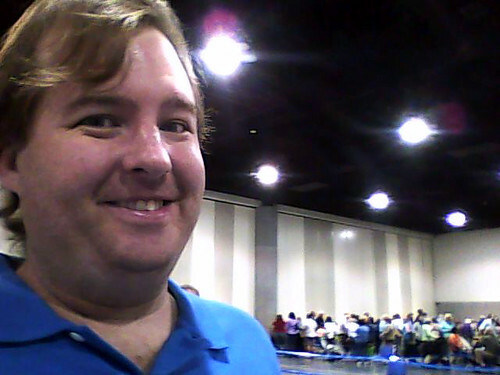 The line works on a "go to the next available appraiser" basis, and for a whole minute I thought we were going to get the enthusiastic white-ponytailed guy who always does the music merchandise on the show. That would've been a treat in itself. Instead, we got Mr. Sourpuss. Alas, my overcompensatingly agreeable nature did not crack Mr. Sourpuss. First I showed him my great-grandfather's knife. I said that I was just curious about its age, since my Uncle Pat gave it to me, and Uncle Pat had a tendency to tweak the historical details when it improved a story. I think I offended Sourpuss with that, even though I was smiling, like I was some young chit (at 40 then) who doesn't respect the tales of her elders. Look, Uncle Pat admitted to me, once we became extremely good friends, that he romanticized some of the things he'd told other family members about our ancestors. He saw that I was serious about the research and was finding interesting stuff without the addition of any blarney, and Uncle Pat (born on St. Patrick's Day and more Irish than a leprechaun... despite being the product of four generations of non-Irish marriages in America) eventually sang true. This was after he gave me the knife and the watch, though, so I still had to take their provenance with a grain of Limerick-licked salt. Maybe I'm just projecting. Anyway, Sourpuss quickly agreed that the knife was from "around 1910 or so" and that was that. No pointing to the grooves or the icon or the shape and offering a sentence of explanation. He was like one of those food/movie/whatever critics who yays or nays something without saying why. I started with a vague, "We have this postcard sent from Helena Rubinstein and wonder if there's anything you could tell us about it." He flipped it over and said, "It's an ad card." "An ad card?" I politely repeated. "Yeah, something companies send out to advertise. They're pre-printed. That signature is printed on there." 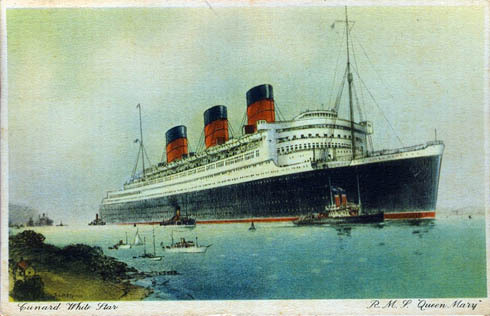 "Ah, it seems... unusual... that it would be on a Queen Mary postcard. We thought perhaps she was traveling... we know she traveled a lot on the QM and was doing some work..." "No, it's an ad card. Everyone wants there to be a nice little story, but companies sent these out all the time." The appraiser next to him, a woman of my mother's age who would have a very good idea of who Helena Rubinstein was and perhaps even know something of the dogged work ethic behind her company, tried to keep looking over at the card, but she was busy at the same time and this was clearly Sourpuss' territory. Sigh. Maybe Sourpuss was right. Even if it's just the 1930s equivalent of spam, though, he needn't have been so shirty. The card is personally addressed to the recipient. Yes, electric typewriters did wonderful things with mail-merge (as I learned all too much about in the 1970s and 1980s, working with my parents), but this is from before those heady days. Some poor secretary may have typed up a mass of them, but it wasn't a mass printing. It's a real QM postcard. If HR had these printed up to advertise, wouldn't she have gone with something to do with the product on the other side? Sure, Rubinstein was frugal... but I still don't think she got a bulk deal on QM postcards then had her secretary pool get busy with them when she got home. She begins with "Returning from Easter on the Riviera," indicating that she is in the act of the return at this moment, meaning she is on the ship from Europe to New York. (And you can see that the card is postmarked "Grand Cent. Annex" in New York.) Alas, I can't read the year, and Google has failed me on finding a list of QM sail/arrival dates. Okay, so this could all be a lie (despite Rubinstein's well-publicized history of travel on the QM) to make a better back-story to the product. 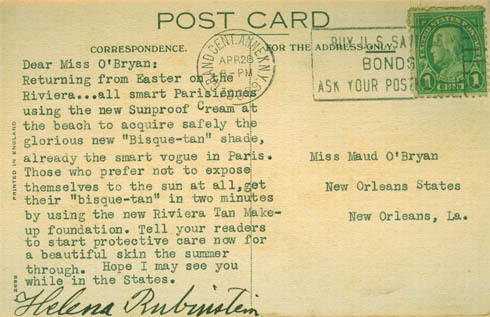 I don't think Rubinstein was that creative, but pretending to write to people while on vacation would be a clever marketing trick. I don't care what Sourpuss says, the signature looks real. It's a little more crude than some of her other autographs that I've seen online. Maybe we're both a little right, and maybe one of us is more right than the other, and maybe it's Sourpuss who has the edge. (Although Occam's Razor says that my theory - the card was typed by someone during the transatlantic voyage and signed by HR - is the most likely, so at this point I'm just being polite.) What cheesed me off, though, was his dismissal and disinterest. Basically, "It's an ad card. Step aside, puny amateurs." After that we signed up to win a few things but forgot to go to the booth to film our farewell. That's okay; we kept repeating "but we had a good time" just like the people on TV do, and Mr. Sourpuss and his terse disdain was soon forgotten. Oh, and when I got home, I realized that I'd grabbed the wrong knife. 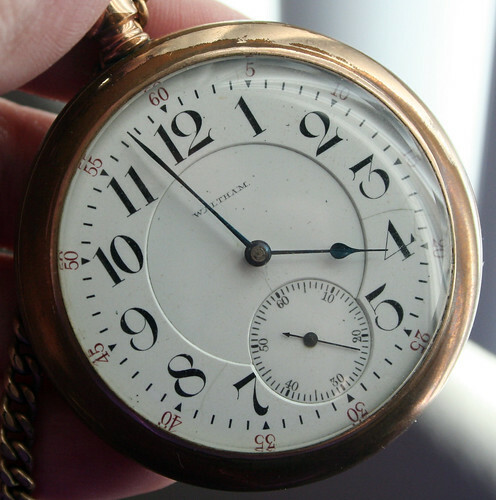 The one my great-great-grandfather used? Still attached to his watch chain. I'd picked up the other knife, the one Uncle Pat said he bought at some point to keep the first one company. Oops! We did have a good time, and we will record each and every San Diego episode next season, looking for our blob o' blue milling in the background. (And waiting to hear which Walberg takes were used.) I'll gladly enter the ticket lottery for next season if they're coming anywhere nearby... which means it's off to eBay to see what new tortures wait for Mike. Perhaps an old shoe or a broken teacup? And a fictional beloved relative to smear on the pathos? And then we'll send photos to my mother-in-law! I can't wait.